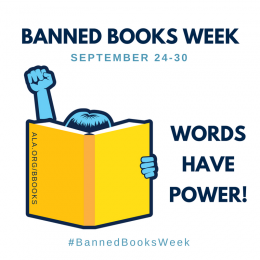 Celebrate Banned Books Week, September 24-30, by joining the Journalism & Mass Communication Department and the Library as we host a Banned Books Read-Out in the Library Lobby on Wednesday, October 4 from 4:30-6:30pm. Register now to guarantee a participation slot! Need ideas? Go to the HSU Library's Banned Books Week website for more information including the link of most challenged books for 2016, videos, and infographics. See the display in the wall case by the 1st floor restrooms running through October 2. Find a book on the list and Stand Up for Your Right to Read!